LaCie this week has taken the wraps off of the latest member of their family of DAS devices, the 2big Dock. The newly revealed dock is their first Thunderbolt 3/USB-C-enabled dock, offering the latest in connectivity for laptops and PCs. Operating as both a DAS and a TB3/USB-C hub, the 2big Dock integrates two high-performance hard drives while offering a card reader, a USB 3.0 Type-A port, and a DisplayPort (1.2). The 2big Dock offers up to 20 TB capacity with a sequential read/write speed of up to 440 MB/s. 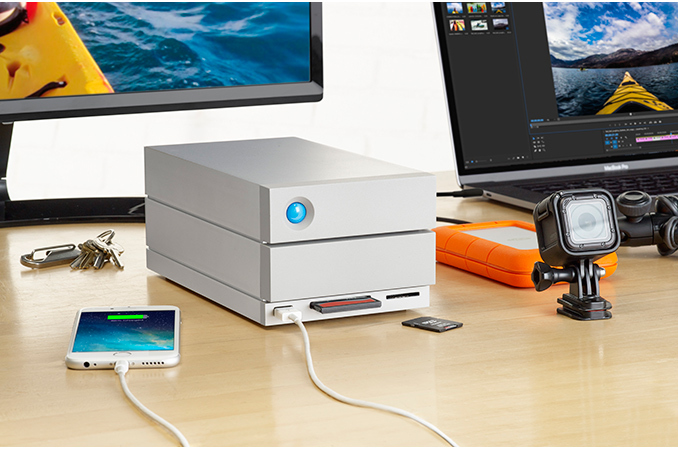 Like their prior Thunderbolt 2 docks, LaCie is aiming to fully leverage the capabilities and intended use cases for Thunderbolt-equipped laptops. As discussed multiple times, modern high-end laptops are so thin that it in many cases it is physically impossible (or very complicated) to install full-sized USB Type-A or DisplayPort headers on them and sometimes there is no space for memory card readers in the chassis (this is the case with Apple’s MacBook and MacBook Pro, HP’s Spectre and some other), which means that many people need docking stations to fulfill their connectivity needs. LaCie is a well-known name in the DAS business, however prior to now they've never done anything approaching a dock. So as you'd expect for a company whose core strength is in the storage business, the company has opted to build an entry-level DAS that also doubles as a Thunderbolt 3 dock. All-told, the 2big Dock offers card reader supporting SD and CompactFlash cards, a DisplayPort, a USB 3.0 Type-A port, and a USB 3.0 Type-C port with power delivery, while allowing the Dock to be used with both Thunderbolt 3 and pure USB-C host devices. LaCie is going to offer three versions of the 2big Dock DAS: with 12 TB, 16 TB and 20 TB capacities, all based on the Seagate IronWolf Pro enterprise-class drives for NAS. The DAS fully supports RAID 1 and RAID 0 capabilities for two HDDs — so owners can ensure either maximum reliability for their data (by mirroring them), or double their sequential read/write speeds up to ~440 MB/s (by striping them). LaCie does not disclose the exact controller it uses to enable hardware RAID functionality, but it is logical to assume that it is the ASMedia ASM1092R chip, which has two device ports and one host SATA port (and which was used in the previous-gen 2big DAS). As for controllers for the docking station, the manufacturer also remains tight-lipped and we do not know what kind of bridges are used for PCIe and SATA bridging, PCIe and USB bridging, or the card reader. Just like many other Thunderbolt 3 devices, the 2big Dock has two TB3 headers in a bid to daisy chain other TB3 devices, such as displays or special-purpose hardware. The 2big Dock DAS is also compatible with the previous-gen computers featuring Thunderbolt 2 ports (e.g., Apple’s Mac Pro and MacBook Pro) via a special adapter from Apple. 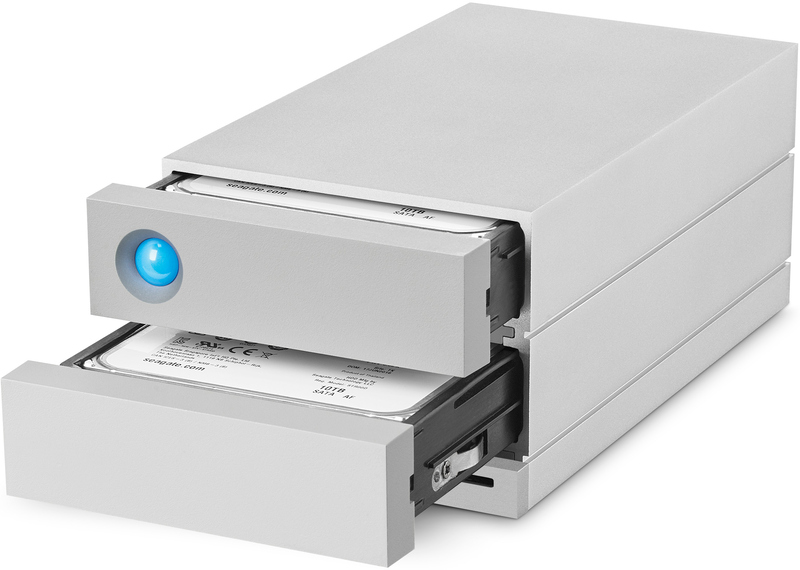 The LaCie 2big Dock will be available this summer and will be covered by the company’s five-year warranty. Pricing is not announced, but since we are talking about a dual-bay DAS, it is not going to be astronomical. At least, expect the 20 TB version to be considerably more affordable than the 6big 24 TB ($3000). -As discussed multiple times, modern high-end laptops are so thin that they're totally useless trash. "Oh, we have this laptop that is so thin and light it is almost like carrying a sheet of paper! Never mind the five pounds of hubs and adapters you will have to carry to turn one USB-C port into a card reader, charging port, video connector, keyboard connector, mouse connector, et cetera. No, we can't put six USB-A ports on the back, that would make it TOO BIG!" The assumption is that your laptop already has an NVMe drive attached to the PCI bus for the OS and your applications, and what you need is a place to store large files with some additional ports. You mean you'd rather this use a USB Type-A port rather than a USB Type-C port? Or do you mean you'd rather see this use the slower USB 3.1 gen1 (aka USB 3.0) rather than the gen2 that TB3 provides? See, either way you're using USB. But the whole point of this device is to wrap up several functionalities in one. So when you come home, you want to plug in your laptop to your display, a full size keyboard and mouse, and some USB storage, maybe ethernet. You're seeing this done through docks, like the Dell TB3 dock that they match with their XPS computers. But this is no dock of yesteryear, this is a standard port, so you're seeing high end monitors with USB Type-C! Plug your laptop into your monitor, which then charges the laptop, works at 4K 60Hz, and has a USB hub for keyboard/mouse and fast storage.